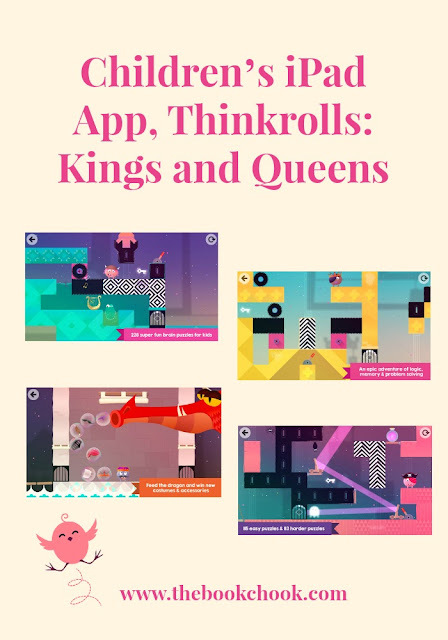 Thinkrolls: Kings and Queens is a physics puzzle app, available for iPad and Android. I’ve previously reviewed Bec and Bo, Avokiddo Emotions, ABC Ride and the original Thinkrolls. Thinkrolls: Kings and Queens is an epic adventure of logic, physics, and fun! Kids think their way through 228 brilliant puzzles that sharpen their memory and problem-solving skills. This game has it all; castles, dragons, simple machines, physics, enchanting spells, and a touch of magic! The goal is simple: Move, handle and combine objects to clear a path, obtain the key, and open the gate to the next level. Exciting challenges await you at every turn! Lull a cool crocodile to sleep with a song. Make a goofy ghost vanish with reflected light. Collect tasty candy and precious gems to please the castle's dragon. Win crowns, tiaras, mustaches, costumes, and many more majestic accessories to create your own unique Thinkroll characters. There’s the same trademark appealing illustrative style in this new Thinkrolls game. Navigation is pretty much a matter of proceeding along a pathway, at your own pace, trying to get to the key. It may sound simple, and it is at first, but after a while, you need to think hard about how to proceed. I would like to tell you all that I made it through to the hard level, suggested for kids over 8. But I can’t lie! Still, I played the easier level enough to discover it is a nicely balanced blend of puzzle, challenge and fun. Having users create their own rolling game piece or avatar at the start is an inspired touch. And the backgrounds of castles, drawbridges, levers, bats, spiders and dragons make for colourful and atmospheric gameplay with a touch of humour. You can get more of an idea of Thinkrolls: Kings and Queens by viewing its trailer, below. Thinkrolls: Kings & Queens - Video trailer iOS & Android from Avokiddo on Vimeo. Check out all of my iPad App Reviews on Pinterest, and find more apps and articles via my Listly page. I’ll be adding this app to my List of iPad Puzzle Apps for Kids.